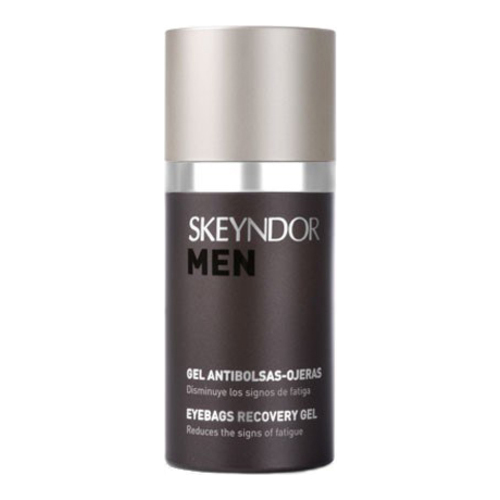 An eye gel for men that decongests the eye area. Decongestant gel for reducing signs of tiredness around the eyes and softening any eye bags. It contains fresh mango cells and liposomes with water from Swiss glaciers. Its formula helps to reduce signs of stress and maintain an optimum degree of moisture. It also produces a calming, refreshing feeling around the eye contour. Result: Reducing effect on the bags around the eyes. Active Ingredients: Organic silicon, Vitamin C, collagen amino acids, skin lifting agents, extracts with reduction-draining action. Apply the product with a soft massage from inwards to outwards, paying particular attention to the area under the eye.